For a unique taste tour of Canada this unique scallops recipe is just the ticket. Fresh Sea Scallops from icy cold Canadian waters, seared in fresh creamery butter with a Drambuie liqueur reduction and finished off with a sweet drizzle of pure Maple Syrup. Cooking scallops never tasted so good. Every element of this recipe reflects true Canadian heritage. 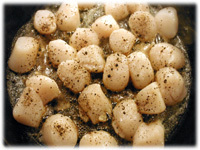 This scallops recipe is perfect as a side dish but has become very popular at home served as an appetizer. 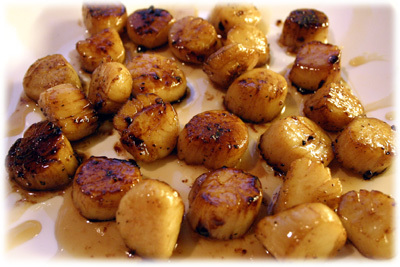 This is also a very easy recipe to use if your just learning to cook scallops, it's extremely forgiving. 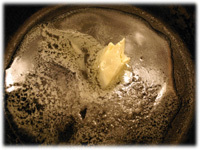 Melt the butter in a cast iron pan over medium-heat. When the butters bubbling and just as it begins to turn brown, arrange the scallops in the pan so there's a space between each one. 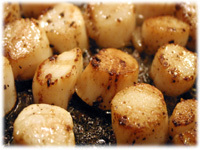 Sprinkle freshly crushed black pepper over the scallops. Cook for 3 - 5 minutes or until the bottoms brown up nicely. The scallops should be starting to turn opaque. Move these around the pan with your tongs to keep them from sticking and to ensure the butter is working each one. 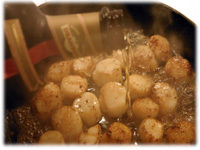 With a pair of tongs wiggle each scallop to loosen and flip them over one at a time in the pan. Pour the Drambuie into the pan. It will begin to loosen the tasty brown bits on the bottom of the pan. After several minutes, the Drambuie will reduce and the mixture will become stickier. Keep moving the scallops around to ensure they're all evenly coated with this butter/Drambuie reduction. 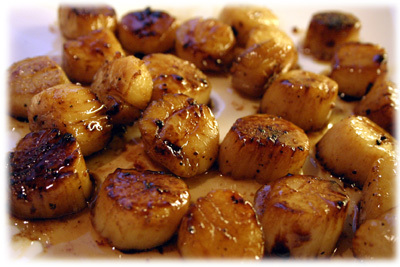 Remove the scallops to a serving plate and drizzle the Maple Syrup over the scallops.